Engage students in STEM (science, technology, engineering, and math) by examining the physical characteristics of leaves. The suggestions below are enrichments for Project Learning Tree’s Looking at Leaves activity, found in PLT’s PreK-8 Environmental Education Activity Guide. Be sure to check out the full lesson! Getting Started: Leaves are food factories for trees. Some trees drop all of their leaves in the fall (e.g., oaks), while others retain most of their leaves (e.g., pines). 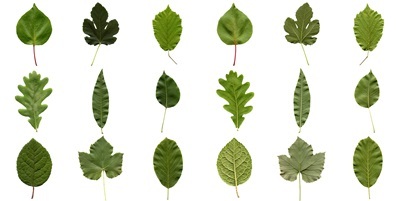 All tree leaves have physical characteristics that make each species unique. Essential Question: What characteristics help us to identify trees? What essential details and observations are necessary for proper tree identification? Dendrology is the scientific study of trees. Students can learn how to identify leaf structure and arrangement using the proper scientific terminology. Simple technology such as a hand lens or magnifying glass can be used to assist the student when examining leaf parts. Computer technology such as digital video and document cameras work very well to see the leaf structures in greater detail (microscopes are good, but not necessary). Read about how you can use a baking soda mixture with a few tools (tray, cotton swab, and paintbrush) to examine leaf veins close-up. Leaves produce tree food (sugar) through a chemical process (photosynthesis). In this process, gaseous carbon dioxide (CO2) is the raw material, sunlight is the energy source used to break it down, and the products of this reaction are water, oxygen, and sugar (C6H12O6). This sugar is the primary source of food for trees. Guide students in creating a photosynthesis 3-D leaf model. Alternatively, teachers can first create the model and challenge students to label the different parts as an assessment. 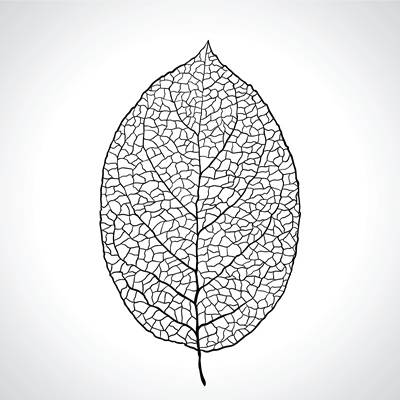 Simple math can be used to calculate the total surface area of a leaf. Select leaves from different tree species and calculate the leaf surface area using graph paper. For older students, watch this video to learn how computer software can be used calculate leaf area. Don’t consider yourself a formal teacher? Check out PLT’s Looking at Leaves family activity. We have 40+ nature activities for families that can be easily used by parents, grandparents, youth group leaders, nature centers, and other nonformal programs. Use this PLT activity to examine products in today’s technology-based world and reflect on present, past, and future attitudes toward natural resource consumption.